Quilty Pleasures Quilt Shop, Ottawa, offers a variety of classes on quilting and sewing. Class fees must be paid at the time of registration. For your convenience, we can accept your credit card payment over the telephone. We understand that a registrant may not be able to attend a class for any number of worthy reasons, but to ensure that classes do not have to be cancelled at the last minute because of withdrawals, no refunds or credits will be issued unless the class is cancelled by Quilty Pleasures. Placing your name on a waiting list without payment does not guarantee you a space. If a class is full, give us your name for a waiting list. If numbers warrant, we will schedule additional classes. Classroom machines are available, but please reserve your machine in advance. When using a classroom machine, you still must supply your own needles and thread, and if you wish to keep your bobbin thread, you will be required to pay for the bobbin. PLEASE CHECK YOUR CLASS SUPPLY LIST AND PREPARATION INSTRUCTIONS BEFORE COMING TO CLASS. AS A COURTESY TO YOUR CLASSMATES AND TEACHER, AND TO OBTAIN THE MAXIMUM BENEFIT FROM THE ALLOTTED CLASS TIME, PLEASE COME TO CLASS WITH THE CUTTING SPECIFIED AND OTHER PREPARATION WORK COMPLETED, AND MAKE SURE YOU HAVE ALL OF THE REQUIRED FABRICS AND SUPPLIES. Please note that we do not give refunds for cut fabric. If we cancel a class, we will be happy to refund the cost of the class plus any rulers, books, patterns, etc. that were purchased specifically for that class (must be in original packaging and condition when returned). If you don't want to take the chance of being stuck with unwanted fabric (is that a thing? ), please wait to buy your fabric when you know the class is definitely happening. Supplies specified on the supply list are all available at Quilty Pleasures unless otherwise noted. If a specific product is listed, please do not make substitutions. Our teachers are familiar with the products they recommend and cannot guarantee good results with alternative brands. Make sure that all of your supplies are labelled and identifiable as yours. Quilty Pleasures is not responsible for items lost or misplaced during class. We offer a 10% discount on class supplies. In general, all class supplies may be purchased at Quilty Pleasures. Thank you for supporting your local quilt shop! Please ensure that your machine is in good working order prior to class. We do have a resident technician if you think you might need a tune-up, and carry or can order feet, bobbins and parts for almost any make and model. During the winter months, please don't forget to bring slippers or indoor shoes to class. Schedule in Calendar Format Here's the class schedule in calendar format. You can view the schedule by month and click the class title for a description. Pages are easily printable from your browser. You can still view the classes below as you normally would! 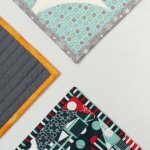 Beginner: Has some quilting experience, understands basic quilting terms & techniques (e.g. 1/4" seam allowance) and knows how to use a rotary cutter. Intermediate: Has experience with basic quilting projects and is ready for more advanced techniques. Advanced: Has a great deal of quilting experience and is very skilled and comfortable with various techniques. All: All levels except Novice. NOTE: Just click on the class title for more details, such as dates, times, cost, instructor, etc. Sorry, we can't register students electronically -- please call us at 613-834-3044 with any questions and to register for your classes. One of our favourite patterns from Jaybird Quilts using the Sidekick or Super Sidekick ruler. Perfect for a jelly roll -- just add a contrasting background and soon you'll be seeing stars! It's an important, yet often forgotten, part of your quilt. Learn how to calculate, cut, and apply your binding, with special attention paid to the Dreaded Mitered Corner and achieving a perfect finish. Don't get caught in a bind - take this class and finish those quilts! You can almost hear the birds singing in this fresh-as-springtime wall hanging. Choose your cheeriest fabrics for this one -- it's easy to piece, thanks to the Mini Quick Curve Ruler, and it will make you happy all year long! These wallflowers are no shrinking violets! Strategic colour placement lets them pop off the background in a stunningly graphic design. If you have any fear of triangles, this quilt will conquer them! Try this streamlined duffle for a carefree carry-on. The hard part is choosing your size (small, medium or large) and your style (square or rounded ends). After that, it's easy: flat construction, no hardware, and a super-simple zipper installation. After this class, you'll be good to go! FanFaire is designed as a six month block of the month with each block made twice to total twelve blocks. For your convenience, Valerie has condensed it into only 4 sessions! Every block teaches you a new way to use the Creative Grids 60 Degree Diamond Ruler, designed by Krista Moser. Cut a combination of diamonds, triangles, hexagons, parallelograms and trapezoids to create this fun quilt, and all with one ruler! This quilt goes together fast and is oh so striking! An essential accessory for anyone with a sewing machine! The clear vinyl pockets keep all of your feet, needles, and small gadgets protected and accessible, while the zipper closures keep them safe and secure. Designed to hang on the wall by your machine or fold up for travelling, the foot folio allows you to always put your best foot forward! This is the relaxed version of our machine quilting classes. Spread over three weeks, it allows you plenty of practice time with both feed-dog assisted and free-motion quilting. By the end of the course, you'll wonder why you were nervous! More fun with free motion! Now that you already know the basics, expand your repertoire of designs and improve your level of confidence with more advanced quilting patterns. Got scraps that are driving you crazy? Put them to good use with this fun, forgiving (and addictive!) technique. Learn how to use up the bits and pieces left over from other projects and give them new life. You'll feel frugal and virtuous, and you'll be preserving your mental health! Try this great technique that will open up a whole new world for you! You'll take one large-scale, multi-hued fabric, cut it up, and rearrange the pieces to create a variety of fascinating kaleidoscopic designs. You won't recognize your original fabric, but you'll love the results! This stunning runner is a stress-free project, thanks to the Creative Grids Pineapple Trim Tool. Go ahead and choose high-contrast fabrics -- your points will always be perfect, even if your sewing isn't. This novice class starts from the basics -- preparing, measuring, and rotary cutting fabric, perfecting the elusive 1/4" seam, and pressing. It will then lead you through the process of making a sampler quilt that can be as funky or traditional as you like. You'll make a variety of traditional pieced blocks, along with some applique, and they'll all be assembled into a quilt top that you'll be proud to display as your first ever quilt. But not your last! So you've finished your Quilting I class. Now what? Learn how to sandwich a quilt top, batting, and backing and quilt it with basic straight line quilting using your machine's feed dogs to guide the layers. We may even throw in a few gentle curves for fun! You'll practice on muslin sandwiches in class, then you'll be one step closer to turning your QI top into a finished quilt! Give the traditional Drunkard's Path a modern spin : strip piece your fabrics to make your blocks (fat quarters and/or jelly rolls work perfectly), then cut them with gentle curves. Swap them out and sew them back together. That's it -- seams don't match, so the stress level is low, but the dynamic results keep the excitement level high. Made from batik strip pre-cuts, this is a beautifully graphic design made even more interesting by the dimensional curved accents. It's fun to make, and you'll love the curved technique.